WHO, UNICEF and IBFAN are hosting an evening of discussion on national implementation of the International Code of Marketing of Breast-milk Substitutes and subsequent relevant WHA resolutions. 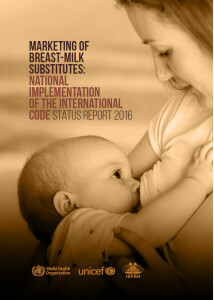 WHO, UNICEF and IBFAN have prepared the first joint global report on the status of the Code in 194 countries. The report presents the legal status of the Code, including to what extent Code provisions have been incorporated in national legal measures, and provides information on the efforts made by countries to monitor and enforce the Code through the establishment of formal mechanisms. To enhance support to countries for International Code implementation, WHO has formed a network of UN, civil society, and academic organizations. Called NetCode, this partnership is developing protocols and tools for Code monitoring and enforcement, providing direct technical assistance to countries, and advocating for complete adherence to the International Code.